**Finalist in Mark Lawrence's SPFBO 2016! ** **More Than 500 5-Star Reviews for A DANCE OF DRAGONS On Goodreads! ** From bestselling author Kaitlyn Davis comes a fantasy adventure perfect for fans of Sarah J. Maas, Kristin Cashore, and Tamora Pierce! 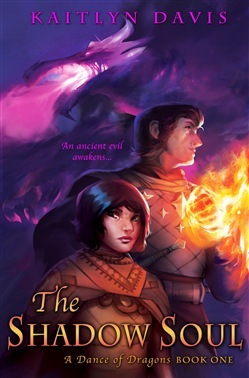 Told in alternating male and female perspectives, THE SHADOW SOUL has been hailed as "an amazing start to a new series that is going to have people of all ages wanting so much more." (Happy Tails & Tales Reviews) When Jinji's home is destroyed, she is left with nowhere to run and no one to run to--until she meets Rhen, a prince chasing rumors that foreign enemies have landed on his shores. Masquerading as a boy, Jinji joins Rhen with vengeance in her heart. But traveling together doesn't mean trusting one another, and both are keeping a deep secret--magic. Jinji can weave the elements to create master illusions and Rhen can pull burning flames into his flesh. But while they struggle to hide the truth, a shadow lurks in the night. An ancient evil has reawakened, and unbeknownst to them, these two unlikely companions hold the key to its defeat. Because their meeting was not coincidence--it was fate. And their story has played out before, in a long forgotten time, an age of myth that is about to be reborn... **Rave Reviews for THE SHADOW SOUL! ** "The writing is flawless. The story and plot line, and plot twists, had me captivated and enamored for the first words. I couldn't put this book down for anything, and I absolutely cannot wait for book two...It's an amazing start to a new series that is going to have people of all ages wanting so much more." - Happy Tails and Tales "One word to describe this book: intense! Everything from the battles, to the secrets, to the descriptions of the characters and scenery, are all incredibly intense. This book had me biting my nails, stomach tided in knots, and completely entranced til the last word." - Desert Rose Reviews "Throughout the story, the stakes were always raised. Acquista The Shadow Soul in Epub: dopo aver letto l’ebook The Shadow Soul di Kaitlyn Davis ti invitiamo a lasciarci una Recensione qui sotto: sarà utile agli utenti che non abbiano ancora letto questo libro e che vogliano avere delle opinioni altrui. L’opinione su di un libro è molto soggettiva e per questo leggere eventuali recensioni negative non ci dovrà frenare dall’acquisto, anzi dovrà spingerci ad acquistare il libro in fretta per poter dire la nostra ed eventualmente smentire quanto commentato da altri, contribuendo ad arricchire più possibile i commenti e dare sempre più spunti di confronto al pubblico online.